Usually, one cannot eat all there is to offer at a bakery in one visit, you have to keep going back to make sure you get a general taste of as many baked goodies as you can. Well, that is for the average person. For me, I can gorge in one sitting since I never really know when I will be able to get back around to a place that may not be all that close and easy to nosh at regularly. Fortunately, Les Gourmands Bakery is located in SoMa and a relatively easy walk from my place. Which means I could visit them on more than one occasion. It is why I was able to stretch out my tastings over the course of several food nosh posts. After all of those, I figured I would wrap them up in one post and give you the added bonus of my last visit where I tried one of their few savory options. You know, to get a real taste for the broad range of baked things they have (wink, wink). I think first time around I wasn't overly impressed with the croissant, a signature item at any French bakery. But after my initial reaction, this is a tasty croissant when you consider all the layers have puffed up and there is no uncooked dough going on. It isn't as flakey or buttery as some and I think that just comes down to personal taste. It is on the larger size and will run about $5. Maybe a little more than some other places in town yet still a enough to get your fill of bread. The amandine was a sweet a satisfying little treat. 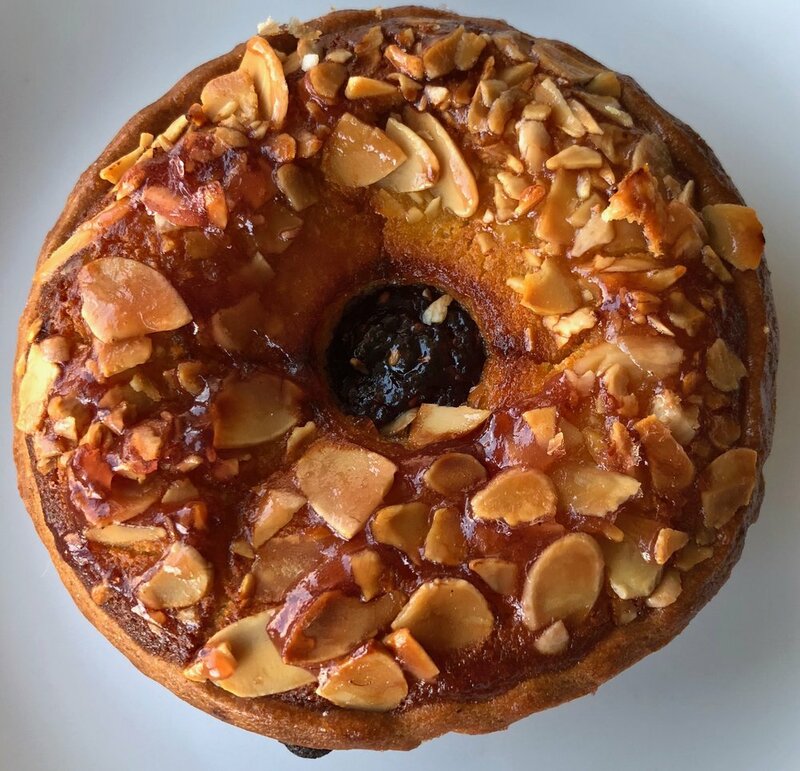 It is like a buttery mini cake with dense moist dough inside, crunchy crust outside and an almond glaze on top. It comes in raspberry or apricot for $7.80. It has heft which I like in my desserts and sweets and if you got this at a restaurant it might run you $10, though they would probably serve it with a scoop of ice cream or something. It is a little pricey, but for the occasional pastry sweet, it was worth it. 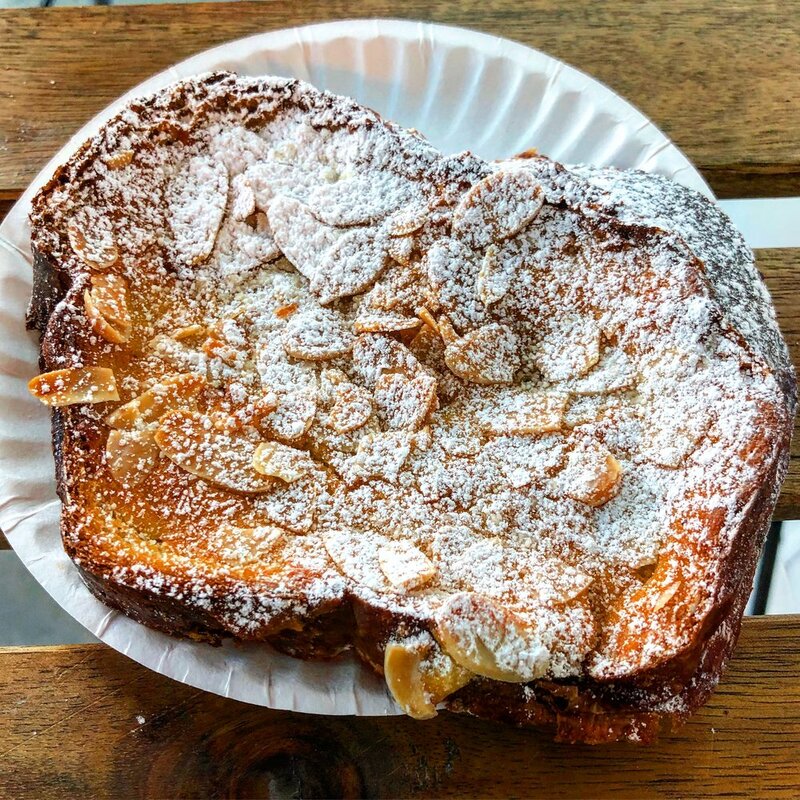 The bostock is basically day old brioche french toast covered in almonds and powdered sugar. The ones here are giant slices of brioche, though they come off a little flat or pressed down. As an afternoon snack or morning pastry with coffee it was fine. I still like the ones from Neighbor Bakehouse better. This was totally a fave of mine. It is a roulee brioche or also called a pepito. It is sweet bread filled with custard and mini chocolate chips. Like a super fancy custard donut. It all the right spots for me with heft, sweet soft bread and lots of filling--enough to get some in every bite. Plus, it is pretty large and while it will run you $5, there is more than enough for two people to have some, if you are the sharing kind of eater. I think we know where I fall on that spectrum. Here is the savory I promised. It was sliced ham, mozzarella, pesto and sun dried tomatoes on a ten inch brioche roll for $5.70. Have to say, this was quite the bargain for what you get. The bread is soft and billowy. The ham is cut in a thick slice. The sun dried tomatoes add a touch of sweetness to compliment the cheese underneath. For what you get and how it tastes, this is definitely on the sandwich bargains in this town. They even have a twelve inch version of this for $7.90 if you have a big appetite and at that price it is still worth it. There are not many places in SF where you can get this kind of sandwich on fresh made bread for less than $10. Les Gourmands Bakery has a lot going on for a bakery. They are French owned and operated and make all their goods in traditional style, like you would find in France. The prices on some of the items might be slightly more than other bakeries but you know for sure here everything is made fresh daily as you can watch it all being made right there behind the counter. And while they specialize in bread loaves and pastries, the fact they have two really good sandwich for less then $10 is more than enough reason to go try the goodies and support them. You'll be glad you did. I'll be glad you did. We'll all be glad you did. Mar 19 Food news and a chocolate bomb y'all!